I didn't have to search for this shot, either - it was just there, the scene that greets you as you walk along the path. It was so pretty - worth every single penny that I pay for my NT membership. Brockhampton had actually done a good job of staying off my sconedar over the past five years. I didn't know anything about it and nobody had ever told me it was fantastic. I think the reason for this is that Brockhampton doesn't have any really scandalous ancestors or celebrity connections. 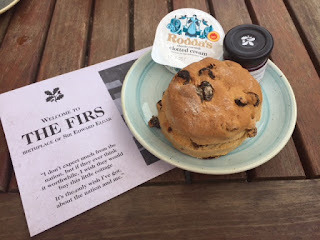 If you are a regular reader, you will know that I am probably the world's worst scone critic, because I just want everything to be brilliant all the time. And so my heart sank a bit when I went into the tearoom and all I could see was a pile of what looked like flat rock buns. They turned out to be the scones. I was worried. However, they were actually very tasty indeed. Very fresh and really light. My earlier scone (yes, I had two scones today - the sacrifices I make for this project, honestly) at Edward Elgar's Birthplace had been a little bit doughy, so Brockhampton was a light, fluffy treat. What's the one thing that you would expect to find at Edward Elgar's birthplace in Worcestershire? I had actually packed some earphones before I set off for The Firs - I figured that if Nimrod was blaring in the car park, with more Nimrod in reception, and yet more Nimrod in the tea room then I could just block it out (if you're thinking 'what's Nimrod? ', you'll recognise it - you can listen to it here). But there was no music. There were a few little snippets in the introductory video but that was it. And I'm not necessarily complaining - the Elgars didn't have Land of Hope and Glory on repeat when he was growing up, so why disturb the quiet. If you're a regular reader, you won't be surprised to hear that I could have written everything I knew about Elgar on a postage stamp before today. In fact, you can fit 'Land of Hope and Glory and Nimrod' on half a postage stamp if you write small. Elgar was born in 1857 on - wait for it - June 2nd. Happy Birthday Ed! Elgar said "I've got a tune that will knock 'em - knock 'em flat"
Fascinating factoid #1 of the day: Elgar was an early supporter of recorded music and he conducted the London Symphony Orchestra for the first recording made at Abbey Road Studios when they opened in 1931. Fascinating factoid #2 of the day: Pomp & Circumstance March No. 1 (ie Land of Hope and Glory) is played at high school and university graduations in the US. You can read more about that here. in there when he was actually using it. But on to the scone. Elgar's views on scones aren't known, but the tea room at The Firs is lovely - it was a beautiful day and I sat outside listening to the birds singing (this probably answers my question as to why they don't play music everywhere). My scone was hefty and absolutely FULL of fruit, which made me think of the comedian Laura Lexx. I have co-opted Laura into my band of Sconepals and she sent me a picture today of an 'excavated' scone as she put it - she hates fruit so she picks out all the currants, leaving a scone that looks like a Swiss cheese. She'd have had her work cut out at The Firs, that's all I can say. Anyway, the scone was very fresh and tasty - it wasn't massively sweet and it was a bit doughy but I really enjoyed it. So there you have it - scone mission number 167 completed. And the day didn't end there - after I left The Firs, I journeyed on to nearby Brockhampton, so watch this space for more about that.